We steamed out of the port of Kodiak, sailing northeast into the Gulf of Alaska. From the bow, I looked back and saw the busy harbor, full of fishing boats of all sizes, slowly fade away. Scanning the water, I saw two sea otters floating on their backs with their arms in the air. I spotted a few puffins dotting the surface of the water, with their characteristic black and white plumage and orange beaks. In the distance, a spout rose from the ocean’s surface, evidence of a whale below. The sea was calm and the sun was shining. I breathed in the salty air. 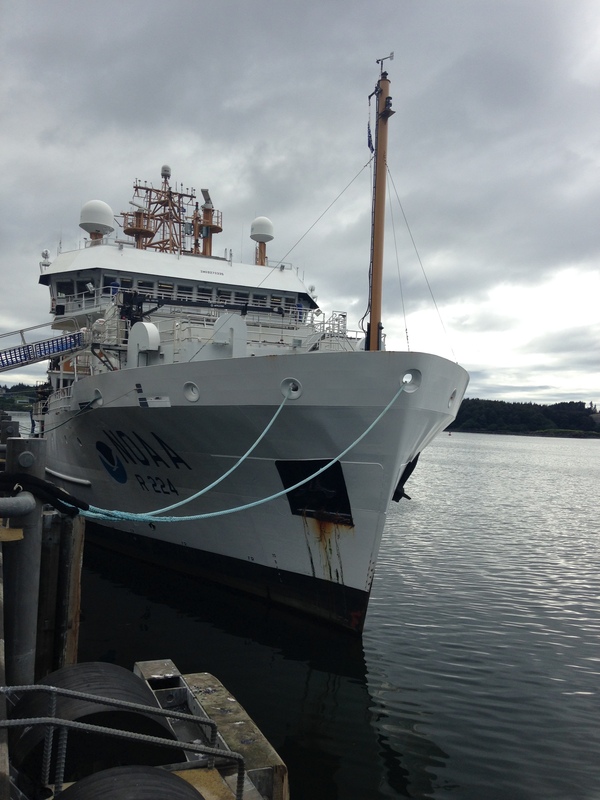 I was feeling grateful to be a NOAA Teacher at Sea and ready for this mission. So what exactly is our mission here aboard the Oscar Dyson? 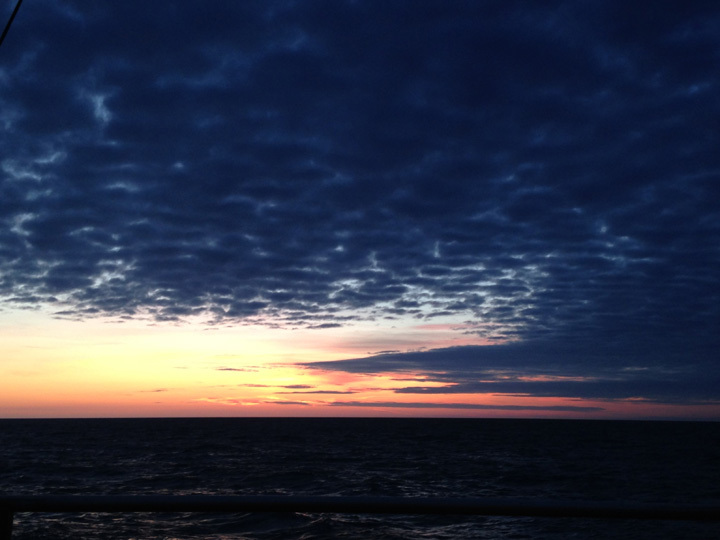 We are conducting fisheries research, primarily a Walleye Pollock Acoustic-Trawl survey. A fish survey is like a scientific fishing trip! The surveys, when conducted consistently and repeatedly over time, allows scientists to monitor trends in fish abundance and changes in the marine ecosystem. The data from these surveys are used, along with data collected from fishermen and other sources, to set sustainable catch limits, ensuring a healthy supply of pollock in the future.. 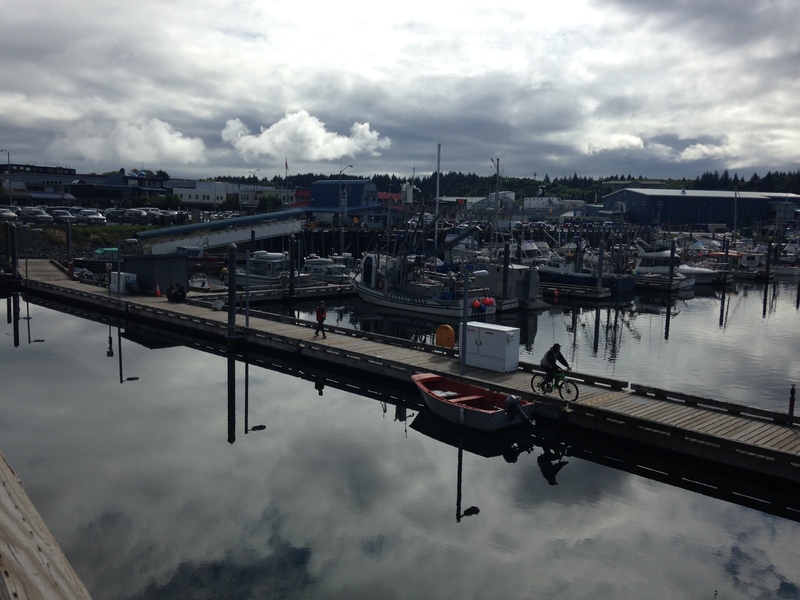 The science team is from the Midwater Assessment and Conservation Engineering (MACE) group of the Alaska Fisheries Science Center in Seattle, Washington. This is the third and final leg of their summer assessment of the walleye pollock population in the Gulf of Alaska. We will be traveling along predetermined, randomized transect lines, and scientists will use acoustic technology, along with catch data from nets towed behind the boat, to assess the pollock population. Walleye pollock is the targeted species, though everything we catch will be identified and measured. You might not have seen walleye pollock on a menu, but you probably have eaten it. Pollock is the “Fish” in McDonald’s “Filet-o-Fish” sandwiches. Pollock are also masters of disguise and can sometimes be found imitating crab meat. Yes, that imitation crab (surimi) in your California roll is usually ground up and re-formed pollock. In fact, the pollock fishery is one of the largest and most valuable in the world. Walleye pollock are a schooling, semi-demersal (bottom) fish that is found at depths up to 1000 feet and widely distributed throughout the North Pacific Ocean. They can grow up to 3.5 feet and live up to about 20 years old. 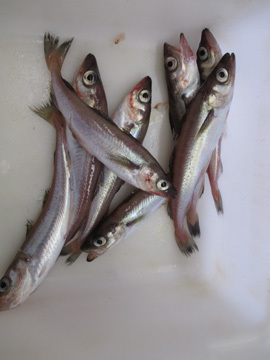 Pollock feed mainly on krill when they are young; when they mature, they eat young pollock and other teleosts (bony fish). That’s right, they are cannibalistic! Recently, after extensive genetic studies, the scientific name of this fish changed from Theragra chalcogramma to Gadus chalcogrammus. This change placed the walleye pollock in an evolutionary lineage that includes the Pacific, Atlantic, and Greenland Cods. In Alaska, about 1.5 million tons of this fish are caught each year. With each fish weighing an average of 3 pounds, that’s about 1 billion fish annually! 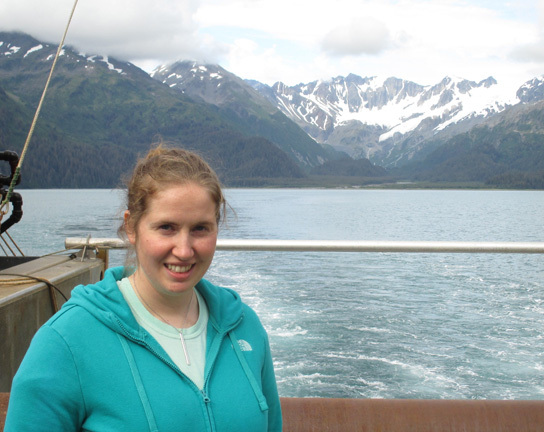 I am on the science team, and for all three legs of the survey this summer, I have been the Lab Lead. I earned a BS in Biology (marine science concentration) from Boston University. I am attending Southern Oregon University in the fall for graduate work in Environmental Education. I certainly like playing with fish, but I enjoy the people the most. This is an awesome group of scientists and I really like meeting new people each cruise, too. I enjoy learning new things from different scientists. Yes, after college, I worked as a fisheries observer for 2 ½ years on various east coast boats from Maine to Virginia and 1 ½ years on boats in Alaska. As an observer, I boarded commercial fishing vessels and kept fishing data on the catch and discarded species and collected biological samples for the National Marine Fisheries Service. I have been on trawlers (pollock, ground fish), gillnet vessels (cod), scallop dredgers, pair trawls (herring), pot vessels (cod) and longliners (halibut, sablefish). Observer data is used to conduct stock assessments, which are used in managing the fisheries. Where do you do most of your work aboard the ship? You can usually find me in the wet lab. I am in charge of the wet lab and sampling all the fish that we catch: identifying, weighing, measuring fish and collecting otoliths and other biological samples. I also help with camera operations and data management, so I am often in the Chem Lab or Acoustics Lab on a computer. I love to travel, hike and snowboard. And I do arts and crafts, like paper arts and beadwork. I miss my friends and family the most (Hi Mom!). And being able to eat out at different restaurants. Bluefin Tuna because they are huge, fast, and they live in the open ocean. So once our work is finished, where do we finally get some rest? 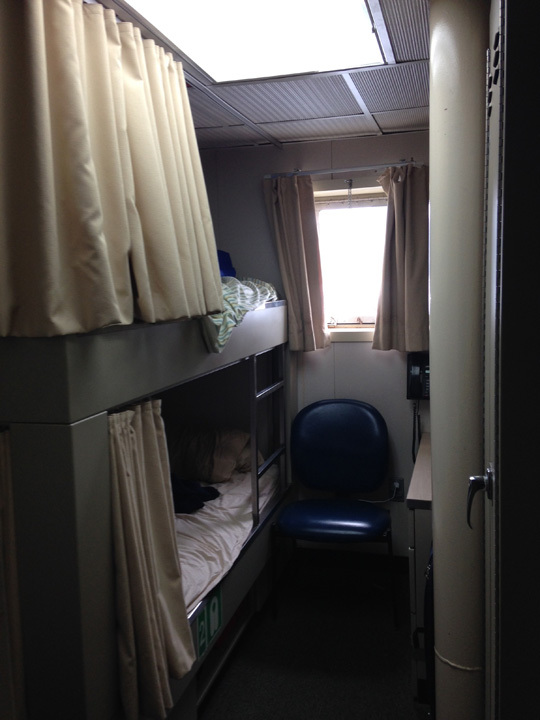 Staterooms are what you call the sleeping quarters aboard the ship. Emily Collins and I share a stateroom. There are bunk beds, and I am on the top and Emily is on the bottom. We each have a locker to store our clothes, and there is a desk and shelving to stow odds and ends. You have to latch the locker doors closed, or they will slam when the ship moves. There is a head (bathroom) with a toilet, sink and shower attached to our stateroom. It is important to keep voices down in your stateroom and moving through the corridors, as people are sleeping at different times of the day! We have a porthole in our room, but since it is summer in the high latitudes, it is dark for only about 4-5 hours a day. The quarters are cozy but comfortable. I enjoy getting lulled to sleep by the rolling motion of the ship. As Teacher at Sea, I am an active member of the science team and I have been assigned the day shift, which means that I work from 4am-4pm. I think this shift will be great because it is a little more of a regular schedule, just getting up really early and going to bed really early. I come on shift when it is actually dark and then, after about an hour, I enjoy the sunrise over the water. During the shift, as our work allows, we can break for breakfast and lunch. And we can get coffee as needed…which is a lot! Safety is the first priority of everyone aboard the Oscar Dyson. The ship’s officers have briefed us about safety procedures, and we have participated in drills for different scenarios, such as Man Overboard and Abandon Ship. For the Abandon Ship drill, we grabbed our PFD (personal floatation device) and survival suit from our staterooms and mustered on the deck to find our lifeboat group. Here’s to a productive and safe voyage aboard the Oscar Dyson! 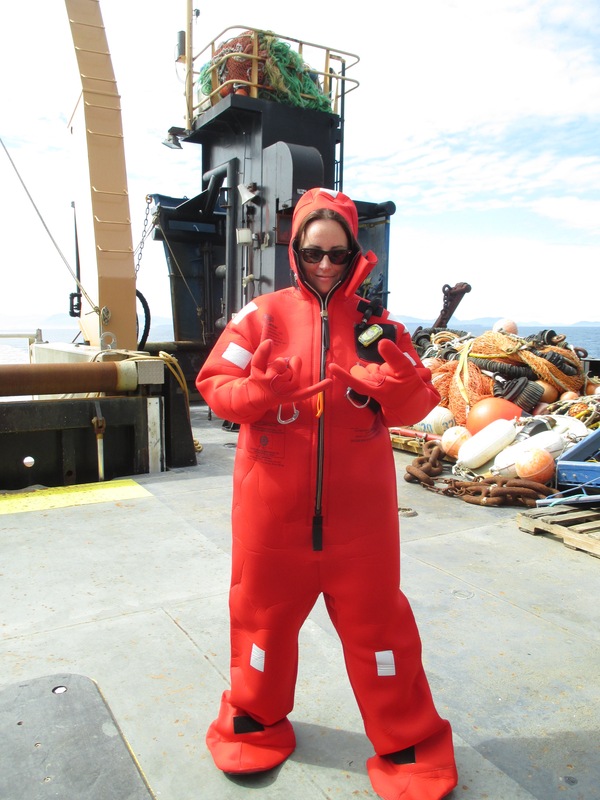 This entry was posted in 2015, Cristina Veresan, NOAA Fisheries Service, NOAA Teacher at Sea and tagged Acoustic Trawl Survey, Alaska Fisheries Science Center, Alaska Pollock, Kodiak Alaska, NOAA Ship Oscar Dyson. Bookmark the permalink.